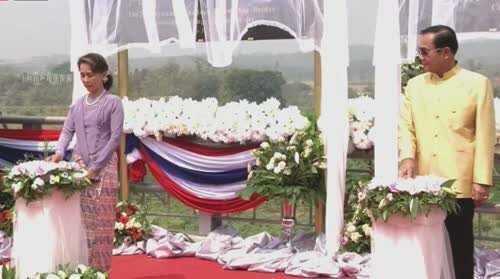 TAK, 19th March 2019 (NNT) – The Prime Minister, Gen. Prayut Chan-o-cha, co-chaired the opening ceremony of the second Thailand-Myanmar Friendship Bridge, linking Thailand’s Mae Sot district in Tak province and Myanmar’s border city of Myawaddy. Gen. Prayut led his cabinet ministers to attend the opening ceremony in Tak province on Tuesday (Mar 19). The event was co-chaired by the State Counselor of Myanmar, Aung San Suu Kyi. The second Thailand-Myanmar Friendship Bridge covers a 17-kilometer road in Thailand and a four-kilometer road in Myawaddy, Myanmar. The bridge also includes border-crossing facilities and government premises. Following the ceremony, Prime Minister Prayut will discuss bilateral cooperation with Ms. Suu Kyi, follow up on the construction of the Border Control Facilities (BCF) building, and meet Thai people in the area. They do say that people are judged by the company they keep. Neither personage can be proud of this joint exercise, and neither attracts any credit for putting on this tawdry show. What happened to the old bridge ? What a timely co-incidence that the opening was planned just a week out from the election to allow the PM in waiting the opportunity to do a bit of public grandstanding for himself and his PP Party. Picture makes my skin crawl, dumb and vile. I was wondering the same, as there was a bridge linking Mae Sot and Myawaddy already. If they just built a bigger and better one, that ceremony looks a bit over the top. The old one is still there but it just couldn't handle the increased volume of traffic ( heavy lorries moving imports and exports ). The new one is about 1 k to the north and has a big dual carriage motorway running up to it ( see on google earth or maps ). The old one will probably stay open for cars and foot traffic. I must have walked over that bridge about 30 or more times. Progress achieved- Thaigeezers find fault. Just another day on the Interweb folks! I knew someone once who couldn't see the blindingly obvious. Turned out there was something wrong with him. I drove across the old bridge into Burma and the main reason for the tremendous mess and congestion is the unbelievable paperwork on both sides. A Thai car with all-English plates and an ITP (international transport permit) requires a completely different set of papers compared to border crossings into Malaysia or Laos. Photocopies to no end, on the way in as well as on the way out and I never managed crossing below three hours. The Burmese, not being shortchanged on the paper trail, require filing of "traversing request" in Rangoon and a physical clearing agent at the border (in and out). The time difference (I kid you not) of 30 minutes between neighbours while both start at 8 am and finish at 8 pm results technically in 11 working hours (lunch time not deducted). All this in the context of ASEAN and AEC2015? This is nothing short of a hilarious if not ridiculous joke on all accounts. Interesting is the political setting of this button pushing exercise. Thailand sends uncle Too (or whatever his name is) while the Burmese wheel out their (able) foreign minister; an appropriate setting would have been to send Don Pramudwinai to be on par with Daw Aung Suu Kyi, and yes, it concerns foreign affairs and connections to a (not so close) neighboring country - me thinks! I drove across the old bridge into Burma and the main reason for the tremendous mess and congestion is the unbelievable paperwork on both sides. A Thai car with all-English plates and an ITP (international transport permit) requires a completely different set of papers compared to border crossings into Malaysia or Laos. Photocopies to no end, on the way in as well as on the way out and I never managed crossing below three hours. The Burmese, not being shortchanged on the paper trail, require filing of "traversing request" in Rangoon and a physical clearing agent at the border (in and out). The time difference (I kid you not) of 30 minutes between neighbours while both start at 8 am and finish at 8 pm results technically in 11 working hours (lunch time not deducted). You are so right - I always smile when I see anything ASEAN related in the news - a bunch of opportunistic countries trying to take advantage of each other - zero trust between them and a human rights record Adolf would be proud of. Most of them comprised of different ethnic and tribal groups held together by a fake, imposed nationalism forced upon them by anti-democratic leadership in all of them. Their leaders grinning with their fake smiles at each other at every opportunity they get to show off while trying to contemplate what the others are up to next to stab them in the back. Most of them 20 years behind the rest of the developed world for no other reason than you describe above because of incompetent leadership and rampant corruption. I was lectured not so long ago by a HISO Thai who is very well connected right into the current leadership of this country. 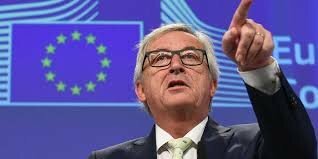 He is a very nice man but lives in total denial of reality - very much like the current leadership. After I listened to his BS for a while - and he seriously told me and he strongly believes that Thailand can be a leading world power - I challenged him and asked - you see Thailand is larger in size than Germany - both countries have roughly the same population and Thailand has the geographical advantage when it comes to agriculture because of the climate - not having a winter. So I asked him tell me why Thailand is so far behind Germany socially, economically and especially when it comes to innovation - despite the geographical advantage. All he came up with was lousy excuses but never with the truth -government officials who are mere puppets never questioning or trying to improve anything ,lack of discipline, thieving incompetent leadership and rampant corruption. Even when Europe still had closed borders it was easy to travel between countries and looking at the mess here with immigration and customs at the borders it is fair to say that it was even easier and less time consuming to travel across the iron curtain between West and East Germany during the Cold War than for example at present from Thailand into Laos or Myanmar by train or by car!